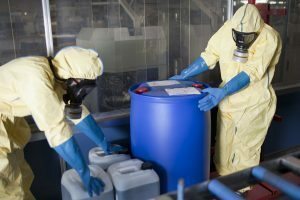 ASI Waste can provide both non-hazardous and hazardous waste disposal solutions for your facility. We have experts to help you properly classify your hazardous wastes to assure proper profiling, packaging, shipping, manifesting and disposal of your various hazardous wastes. The disposal of hazardous wastes can be a complex task due to the many regulations that govern the transportation and appropriate disposal method of these special wastes. Our expertise coupled with our focus on customer service provides our customers peace of mind concerning hazardous and non-hazardous waste disposal. ASI Waste assists in the process of locating a suitable disposal facility, scheduling transportation, profiling samples, and preparing hazardous waste manifests. All of these details can be a time consuming task for a large facility, but are crucial in terms of regulatory compliance. We offer solutions for a wide range of different industries including government agencies, manufacturing and industrial facilities as well as retail and healthcare institutions. ASI Waste works with your facility in finding the most economical means of disposal for your hazardous materials in a professional matter. ASI Waste assists in the process of locating a suitable disposal facility, scheduling transportation, profiling samples, and preparing hazardous waste manifests. All of these details can be a time consuming task for a large facility, but are crucial in terms of regulatory compliance. ASI Waste works with your facility in finding the most economical means of disposal for your hazardous materials in a professional matter. Contact us to see how we can help you with your hazardous waste disposal needs!